NEI-addons and WAILA-Addons do. But even then, there are still quite a few mods that feel like they miss intergration. This mod aims to fill some of the still existing gaps in all those addon mods. And this mod isn't just focused on one mod, instead, it aims to add handlers for as many mods as possible. This mod also features an extensive config to ensure you can enable/disable almost everything! -Feel free to suggest more handlers if you a mod lacks intergration with another mod! NOTE: If you do not have access to the data of a certain block/tile, a message will be added to the hud saying so. 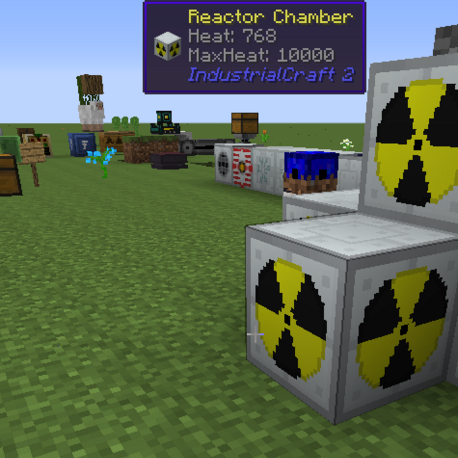 Progress of machines like furnace/macerator/ect. Heat values of nucleair reactors, and other machines that have something to do with heat. The location a teleporter will teleport to. Hide all (but 1 of each type) facades. Hide all (but 1) duplicate blocks from NEI, EG, if you have 12 differently-colored bookstands, only 1 will show in NEI. Hide all (but 1 of each type) multiparts added by ExU. Hide all (but 1 of each type) multipart added by FMP from NEI. Hide all blocks that shouldn't be directly placed from NEI, EG: The top half of a door. And yes, you can use this in your modpacks. I haven't reported on your GitHub because other people already have.